Darjeeling is situated on the lower range of Himalayas. This beautiful hill resort is considered to be a famous summer retreat of the British during the colonial era. The rolling hills with awesome tea gardens, exotic flora and fauna, blooming orchids and the beautiful scenery will never fail to impress people of all age groups. Bagdogra is the nearest airport and is well connected from Kolkata, Delhi and other important airports and is a mere 3 hrs drive from Darjeeling. You can get down in this airport and can easily reach Darjeeling by hiring a car. Darjeeling Mail and various other passenger trains are available on a daily basis from Sealdah Railway station to reach New Jalpaiguri Railway station. The railway station of New Jalpaiguri will be the most convenient railway station fro reaching Darjeeling by train. 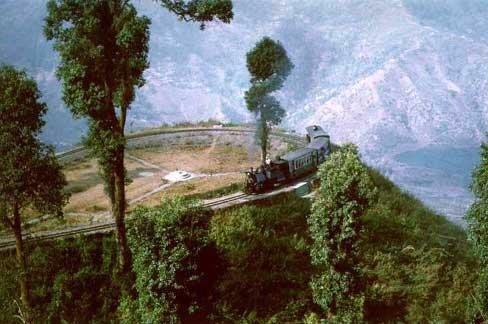 From there you can easily take Toy trains that winds its way up the hills to Darjeeling. Number of luxury State/Private buses runs overnight to Siliguri from Kolkata. From there you can hire a taxi or another bus to reach Darjeeling. It will take nearly 2 hrs. The best time to visit Darjeeling is during the months of April to June and September to December. The weather conditions are best during this period and you can enjoy fully. There are numerous hotels in this hill resort. Right from Heritage hotels to budget hotels, Darjeeling has all. Some of the famous Hotels are Hotel Viceroy, Sterling Resorts Darjeeling, Windamere Heritage Hotel, and Hotel Mayfair etc etc. But it is advisable to do the bookings in advance. Tiger Hill : One who has visited Darjeeling must see the sunrise or sunset from the Tiger Hill. The sight of sunrays failing over the snow capped peaks makes you feel as if you have reached heaven. On a clear day, you may also get a view of the Massive Mount Everest from here. This view is really nice. Darjeeling Tea Gardens : Darjeeling is known for its flourishing tea gardens and Darjeeling Tea Gardens are worth visiting. You can walk down the tea gardens and get a sense of lush greenery and exotic aroma of tea gardens. You can also visit the tea factories. Himalayan Mountaineering Institute : This world-renowned Institute had Tenzing Norgay of Mt. Everest fame as its first field director. The institute offers training in mountain climbing and hosts a beautiful museum with many photos and equipments used in mountaineering purposes. Himalayan Zoological Park : Adjacent to the Mountaineering Insitute, is the Padmaja Naidu Himalayan Zoological Park. This park is one of the best places to discover the rich wildlife of Himalayas. This zoo houses several rare Himalayan animals like Leopards, Red Panda, Tibetan Wolf and many other birds. Ghoom : The town of Ghoom is the highest railway station in the world, which is just 2 kms from Darjeeling. The importance of this place arises from the fact that it harbors one of the most popular monasteries of the hill resort, Ghoom Gompa. It is also a must visit place for the tourists. Senchal Lake in Darjeeling : It is a beautiful lake admist the verdant mountains. It is also considered as a favorite picnic spot for many and is about 10km from the town. This lake provides water supply to the entire Darjeeling town. Darjeeling Chowrasta : Chowrasta stands in the middle of the hill resort and is considered as the hub of commercial activities in Darjeeling. This place is full of shops and vendors selling a wide range of items starting from local handicrafts, tribal ornaments to brass statues and woolen garments. If you want to buy gifts for your near and dear ones, then this is the perfect place. Monasteries around Darjeeling : There are a number of well-known Buddhist Monasteries in Darjeeling. The best known is the Yiga Choeling Monastery, which is Darjeeling's oldest monastery. Others are Dali Monastery, Bhutia Basti Monastery etc.